Have you ever wondered what goes into choosing a fee structure? Many advisors who are starting firms have only worked on the commission side of the industry, and aren’t quite sure about going fee-only. Others may have worked for large RIAs that only charged their clients on an assets under management basis, and are looking for alternative fee structures. 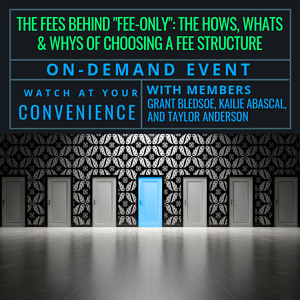 In this on-demand webinar, XYPN members Grant Bledsoe, Kailie Abascal, and Taylor Anderson explore the hows, whats, and whys of choosing a fee structure. Should you charge different fees for different clients, or different services? What do clients really know about "fee-only"? What happens when you want to change your fees? Choosing a Financial Planning Fee Structure: What Are the Options? Grant Bledsoe, CFP®, CFA, started his career at Charles Schwab after finishing his MBA. After seven years, he realized he wanted to help people more directly in an unbiased setting as a fiduciary. To do this, he launched Three Oaks Capital Management, a fee-only registered investment advisory firm. Grant works with business owners and entrepreneurs across the country helping them conceptualize and achieve their ideal life. Kailie Abascal, CFP®, and Taylor Anderson are not only sisters—they're business partners who are purchasing their dad's practice, Middleton & Company. After working internationally in the education and non-profit fields, Kailie now brings her past experiences to work by helping clients think creatively about how they too can go wherever their dreams may lead. Her favorite part of her job is helping her clients define and clarify their goals, and then developing the strategies to help them achieve them. Taylor Anderson and Kailie Abascal, CFP® are not only sisters—they're business partners who are purchasing their dad's practice, Middleton & Company. After volunteering with the Peace Corps, Taylor returned to her hometown of Vancouver, Washington and started working with her sister and father to build a family-owned firm. Taylor's extensive experience in project and change management helps her guide her clients to better financial decisions.